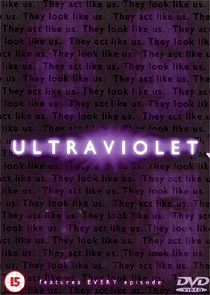 The 1998 Channel 4 television series Ultraviolet joins a rash of modern-day twists on the vampire myths, (Blade, The Kindred, etc), but studiously avoids using the v-word, and presents an engaging and intelligent “what if” scenario about how a race of blood-suckers might be living among us, and what official measures might be taken to counter them. The six-part series has been released as a beautifully packaged two-disc set, from Contender, the company behind the popular Farscape releases. Although the episodes themselves look clean and sharp (in 1.66:1 non-anamorphic format), the sound (2.0 stereo at 192kbps) is typically rather mundane. Sadly there’s little by way of extras, just a couple of trailers, a gallery of about a dozen posed photo’s and biographical notes for the main cast.